Growing speculation related to the US Federal Reserve plans to trim stimulus through bond purchases, continued to affect gold prices on Friday, with bullion dropping 0.2% in New York to $1,308 an ounce. 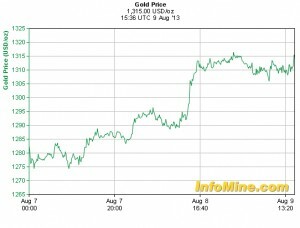 In London, gold for immediate delivery fell 0.3% percent to $1,309 an ounce. The precious metal reversed losses later in the day, trigerred by an oil rally and falling US equities. At 12:01 ET, spot gold was up 0.2% and set for its fourth weekly gain in the past 5 weeks. But while the precious metal was heading for its second weekly loss, Damon Vickers, President of investment brokerage firm Damon Vickers & Co., called investors to sell the rallies and look for more downside. “The only other option is to have no position in gold at all,” he said in an interview with The Street. Vickers added the "fear trade" in gold is over, meaning that using the precious metal as insurance against an end-of-the-world scenario is declining. When questioned about the Fed's plans, Vickers said conjectures have caused more chaos than the actual tapering.